The future belong to smartphones and the quality of apps that are pouring in will punch-us-in-the-face really hard. This is is exactly what Google Goggles is trying to explain to its Android and iPhone users. Developed by Google, the creator of Android, Google Goggles oozes out performance, quality, clutter-free UI and productivity. The app helps its users in obtaining the most in-depth information about a subject by simply taking its picture. The app can be classified under the productivity, utility and entertainment genre, and it surely does not break a sweat while catering to these segments all at once. 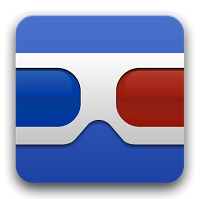 Google Goggles uses a image recognition technology to recognize objects and quickly load all the relevant search results related to the topic. The app identifies products, famous landmarks, storefronts, artwork, and popular images found online. What will really help users all over the world would be the vast language support, with which users can choose and translate languages in English, French, Italian, German, Spanish, Portuguese & Russian. Overall, this app packs-in quite a punch and does the work really neatly. Advanced users, Casual Users, Fun users, this app just cannot be categorized towards a particular class because Google has just wanted to widen its user-base and keep all the Android fans happy.